Living in the age of globalisation, most of us have at least one friend who lives in a different country, on a different continent or even on the other side of the world. Real friends are rare. The kind that you can talk to about anything, know you can trust, who makes you a better person and brings you closer to Allah. Therefore, it is really important to keep these friendships alive and genuinely make an effort to do so. The following tips might be just what you need. First, before thinking about how to stay in touch with your friends, work on being a good friend. Be somebody memorable, someone whom others actually want to be around. As a good friend, you should strive towards being trustworthy, honest, supportive, reliable, helpful, kind and understanding. Eventually, that is what you will be remembered for. Work on perfecting each one of these noble qualities In sha Allah. Never underestimate the power of dua. If you know your friends are going through a hard time or has a difficult exam to pass, make dua for them. This way, even though you cannot be with them, at least they are with you in your prayers. Also remember them in your sujood, ask Allah to make them righteous Muslims and to make it easy for you to stay in touch with each other. Inspire your friends to be the best version of themselves that they can be. Be a source of good in your circle of friends and someone that encourages the others to do righteous deeds. Talk to them about how to be productive, how to make the most of their time or suggest to them beneficial Islamic articles, books, websites, lectures and videos. Not only will you get immense reward for doing so, but you are also helping your friends to become better Muslims, which is something they will appreciate you for In sha Allah. 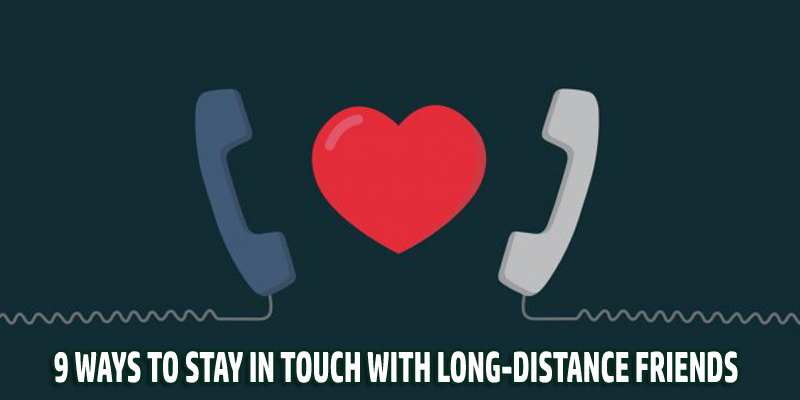 Call your friends from time to time, or send them a short text message showing them that you think about them even though you are far away from each other. I am not suggesting that you should have two-hour conversations every single day. A simple five-minute call to ask about their day will do In sha Allah. Use the Internet to your advantage. Facebook is a really convenient tool to chat with your friends using one-on-one chats or even group chats. You do not have to spend five hours talking to them, just catch up for half an hour. Send them a nice message telling them that you miss them, ask about what is going on in their life or update them on what is going on in yours. Also, if your friends happen to not be on Facebook, there is still the good old e-mail, so no excuses. Try to send them pictures/videos to make them a part of your life and get them involved as much as possible. Tools like Skype are great because you can actually see the person you are talking to. It is a lot more personal than just writing to them online. Obviously it cannot replace the actual person, but it is as close to talking to them in real life as possible. You can have so-called Skype dates and agree on a fixed time every week/month, depending on how much time you have. Also, when you have many friends you want to keep in touch with, you can talk to multiple friends at the same time. It is more efficient to do it that way instead of doing so separately with every single friend that you have. There is something very special about a handwritten letter or card and I think everyone that has received either can attest to it. It demonstrates to the person that you sat down and really thought about what to write to him or her. It is beautiful because he or she can reread the letter or card over and over again, and it is something very valuable that your friend will probably keep forever. Also, if there is a special occasion like Eid or a wedding, and you cannot be with them, it is great to say a few nice words in a card. Getting postcards from various places can be exciting as well. How about you surprise your friends from time to time by sending them a care package or a simple gift? It does not even have to be for a special occasion; just do it because you are friends and you care about that person. If there is a good Islamic book that you would like them to read, for example, that might not be available in their country, this could be a great gift for them. Plan annual get-togethers. Make it a priority to see each other at least once a year. Saving up some money will be necessary for that, so be sure to put aside a certain amount every month. Remember to spend the precious time you have together productively and plan some activities ahead of time if you can. An important point to remember is that it should not always only be you who is making the extra effort. A friendship is a two-way relationship that consists of giving and receiving. So share this article with your friends who live far away and In sha Allah they will apply some of these tips as well. Distance should not matter if you are true friend. If you genuinely care about a person you can always make time for them.